The Papakura Sea Eagles have claimed their first ever SAS Fox Memorial Premiership title, downing the Pt Chevalier Pirates 12-8 in today's grand final. Papakura scored in the opening minutes with wing George Edwards following through lock Roman Hifo to cross on the left edge. An unsuccessful conversion left the score 4-0 to the Sea Eagles. A game fought largely in the middle of the park, ball control looked to be frustrating the Pirates. With 6 minutes remaining in the first half and a penalty to Papakura, halfback Reece Joyce took the kick to lead 6-0 at the break. The second period saw Papakura display some excellent resolve to work their way down field before centre Andrew Tusiane crossed to get the Sea Eagles up 10-0. Finally holding onto the ball and building some pressure, Pt Chevalier lock Dylan Moses proved a game changer, crashing over from close range to score. With the kick going out wide, the Pirates trailed 10-4. Some gritty defence and a big carry from Pt Chevalier prop Siliga Kepaoa saw the side just metres out from the line. Shuffling the ball quickly to the left in an attempt to score again, Papakura's Hifo busted through to pursuit down field before being stopped by fullback Siua Otunuku. Closing in the final 10 minutes and only metres from the line, another penalty gave the Sea Eagles an extra two to lead 12-4. But Pt Chevalier weren't done yet. With two minutes left on the clock, the Pirates crossed on the left edge where wing Saula Solomona finished. Pt Chevalier were unsuccessful in converting and with under a minute remaining, the Sea Eagles had done enough to claim the 2016 SAS Fox Memorial title. 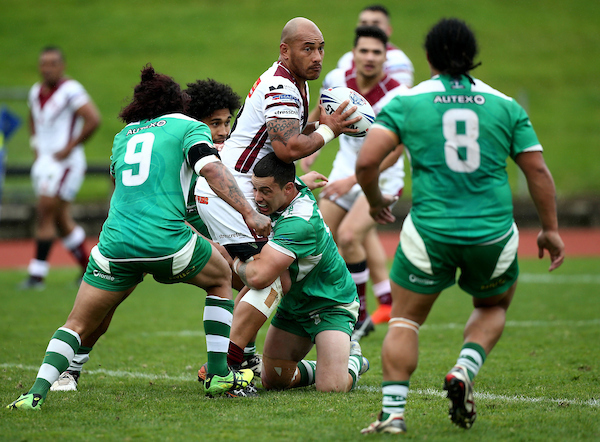 "I'm lost for words," said Papakura captain Roman Hifo. "I've been at the club for 8 years now. It's taken me this long but it's something we've been working hard for." "We started with the Sportsafe ARL Nines in Whitianga and knew if we put the work in we could get the job done. "We finally did it," he quipped. The win coupled with the women's side claiming their championship title in the earlier game has served history in both the Papakura Rugby League club and Auckland Rugby League; winning their first Fox Memorial title but also, the first club to win both the men's and women's premiership in the same season. "The club is in a really good place right now," said Hifo. "The directors, chairman and everyone behind the scenes - they've put in so much time and effort into building this club. "They’ve done a great job and I take my hat off to them." Papakura 12 (George Edwards, Andrew Tusiane tries; Reece Joyce x2 penalty goals) BEAT Pt Chevalier 8 (Dylan Moses, Saula Solomona tries). HT: 6-0.